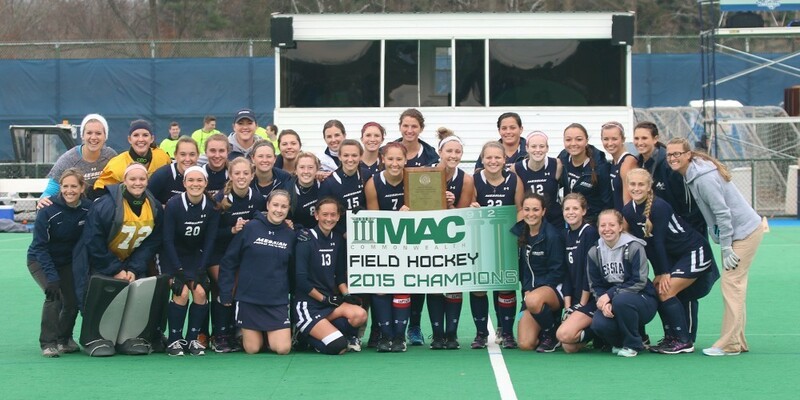 On Saturday, November 7th, the women’s field hockey team faced the Mustangs of Stevenson University on Anderson field for the women’s Field Hockey MAC Commonwealth Championship. Controlling the tempo of the game consistently, Messiah did not struggle to clench the win with a finishing tally of 6 to Stevenson’s 0. The team achieved their 9th consecutive championship win. Messiah won with two hat-tricks – an individual scoring three goals in the same game, by both Carissa Gehman, a sophomore forward, and Moriah Pfautz, a junior forward. Despite her several injuries throughout the season, Pfautz had a huge impact in post-season play for the Falcons. Finishing with a total of five goals in both post-season games, Moriah Pfautz received the Tournament’s Most Outstanding Player Award after the championship game was commenced. Having 23 shots to Stevenson’s 8, the team did not struggle to keep the lead. Scoring 5 of their 6 goals in the first half, Messiah claimed their victory early, Stevenson feeling depleted after such early strikes from the Falcons. The Falcon’s also have three first-team All-MAC Commonwealth players in forward Carissa Gehman, midfielder Lindsay Bower, and defender Hannah Roland, which helped lead them to a large-margined victory. In addition, three second team All-MAC Commonwealth goal keeper Shelby Landes helped shut out the Mustangs. Ranked #14 in the NFHCA top-20 poll, the team “learned of their first stop in the NCAA Championship Tournament. The NCAA released the Division III Field Hockey Championship bracket on Sunday evening, and Messiah College was awarded a First Round bye. The Falcons will travel to The College of New Jersey for their Second Round match-up against the winner of the Wednesday’s First Round game between SUNY New Paltz and Simmons College,” according to gomessiah.edu. Make sure to support the Women’s Field Hockey team in their tournament play by looking on gomessiah.com for updates and game scores.